Renting in the Bay Area: What does $3,200 get you? Looking for an apartment in the Bay Area? We compared what $3,200 might get you in San Francisco, San Jose, Mountain View and Alameda, using data from rental site Zumper to present a snapshot of the area's rental landscape. What amenities and square footage might you get for the money, and how does location change the equation? Rental price medians are calculated considering all of the listings between zero and four bedrooms within a defined geography that appeared in Zumper's database over the 90-day period immediately preceding the publish date of this article. 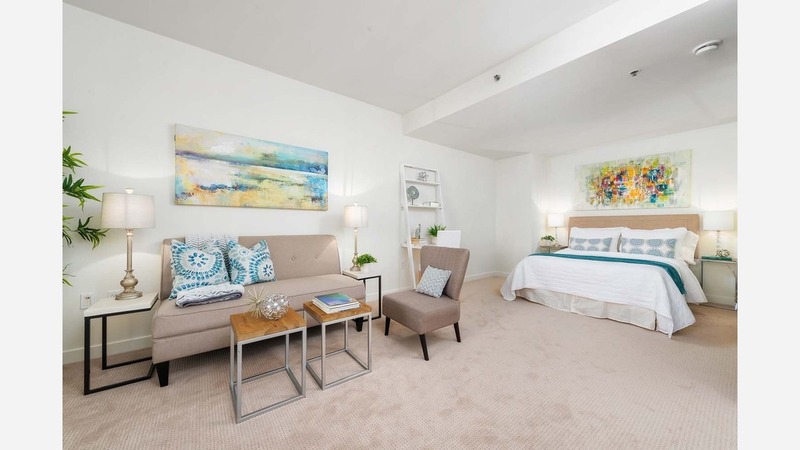 This 618-square-foot studio condo is located at 260 King St. in San Francisco's SoMa neighborhood. Asking $3,200/month, it's priced 36 percent higher than the $2,350 median rent for a studio in San Francisco. Building amenities include a swimming pool, a roof deck, a fitness center, a business center, concierge service, an elevator, assigned parking and storage space. In the unit, expect to find a walk-in closet, in-unit laundry, carpeted floors, a dishwasher, generous closet space and large windows. Neither cats nor dogs are welcome. Next, there's this three-bedroom, two-bathroom spot located at 283 Bernal Road in San Jose's Santa Teresa neighborhood. It's also listed for $3,200/month for its 1,281-square-feet of space--7 percent less than San Jose's median three-bedroom rent of $3,450. In the unit, look for both air conditioning and central heating, hardwood flooring, a walk-in closet, in-unit laundry, a dishwasher, a breakfast bar, granite countertops and stainless steel appliances. The home also offers a two-car garage, outdoor space and a storage shed. Pets are not welcome. According to Walk Score, this location is car-dependent, isn't particularly bikeable and has some transit options. Mountain View -- 1585 Villa St. Listed at $3,200/month, this 951-square-foot two-bedroom, one-bathroom home at 1585 Villa St. in Mountain View's Shoreline West neighborhood is equal to Mountain View's median two-bedroom rent of $3,200. The home features central heating, hardwood flooring, a dishwasher, a fireplace, a stove, bay windows and ample closet space. Luckily for pet owners, both dogs and cats are welcome. Per Walk Score ratings, the area around this address is moderately walkable and offers many nearby public transportation options. Alameda -- 2827 Burgner Ave.
Next, check out this two-bedroom, two-bathroom home at 2827 Burgner Ave. in Alameda. It's listed for $3,200/month, which is 10 percent pricier than Alameda's median two-bedroom rent of $2,900. In the home, you'll get hardwood floors, a dishwasher, in-unit laundry, a fireplace, wooden cabinetry, stainless steel appliances, large windows and garage parking. Cats and dogs are not welcome. According to Walk Score's assessment, the area around this address requires a car for most errands and has a few nearby public transportation options.